Particulate matter that finds its way into the blood or tissues is rapidly removed by cells, and the property of taking up dyes, colloids, etc. was used by anatomists to define a body-wide system of phagocytic cells known as the ‘reticuloendothelial system’ (RES), consisting of the vascular endothelium and reticular tissue cells (top right of Figure 1), and – supposedly descended from these – various types of macrophages with routine functions that included clearing up the body’s own debris and killing and digesting bacteria. However, more modern work has shown a fundamental distinction between those phagocytic cells derived from the bone marrow (blue in figure 1) and endothelial and reticular cells formed locally from the tissues themselves (yellow). Ironically, neither reticular nor endothelial cells are outstandingly phagocytic. Their function is partly structural, in maintaining the integrity of the lymphoid tissue and blood vessels, respectively. However, there is increasing awareness that both cell types have an equally important role as ‘signposts’, regulating the migration of hemopoietin cells from blood into the tissues and through the various sub compartments of lymphoid tissue. In contrast, the major phagocytic tissue cell is the macrophage, and it is therefore more usual today to speak of the ‘mononuclear phagocytic system’ (MPS). The cells of the MPS are now recognized as fundamental to both the ‘recognition’ and the ‘mopping up’ phase of the adaptive immune response. Macrophages and dendritic cells act as tissue sentinels, responding to infection and tissue damage via ‘innate’ receptors and signaling the alarm to adaptive immunity via both antigen presentation and the release of powerful cytokines. 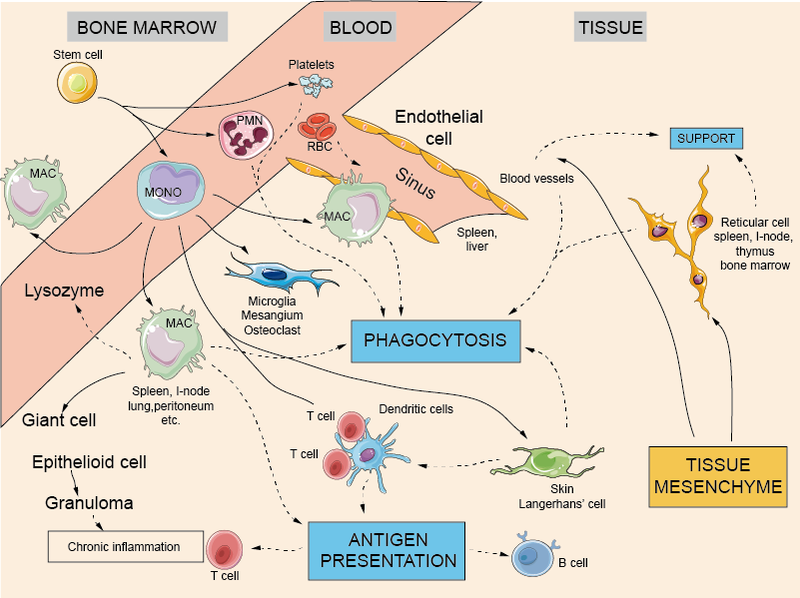 Once an adaptive immune response is established, one of the main roles of antibody is to promote and amplify phagocytosis, while T lymphocytes serve to activate macrophage microbicidal activity. Figure 1. Phagocytic cells and the reticuloendothelial system. Endothelial cell: The inner lining of blood vessels, able to take up dyes, etc. but not truly phagocytic. Endothelial cells direct the passage of leucocytes from blood into tissues, and can both produce and respond to cytokines rather as macrophages do. They can also present antigen directly to T cells under some circumstances. Reticular cell: The main supporting or ‘stromal’ cell of lymphoid organs, usually associated with the collagen-like reticulin fibres, and not easily distinguished from fibroblasts or from other branching or ‘dendritic’ cells – whence a great deal of confusion. Mesangium: Mesangial cells are specialized macrophages found in the kidney, where they phagocytose material deposited in it, particularly complexes of antigen and antibody. Osteoclast: A large multinucleate macrophage responsible for resorbing and so shaping bone and cartilage. It is regulated by cytokines such as TNF-α and IL-1, and is thought to have a role in degenerative diseases of joints such as rheumatoid arthritis. Dendritic cells: The weakly phagocytic Langerhans’ cell of the epidermis, and somewhat similar cells in other tissues migrate through the lymphatic vessels (where they are known as ‘veiled’ cells) or blood to lymph nodes and spleen, where they are the main agents of T-cell stimulation; T cells recognize foreign antigens in association with cell-surface antigens coded for by the MHC, a genetic region intimately involved in immune responses of all kinds. The precursor of the dendritic cell comes from the bone marrow but its precise lineage remains controversial. There are separate follicular dendritic cells for presenting antigen to B cells that specialize in trapping antigen–antibody complexes. They are found in the B-cell areas of lymphoid tissue, but are one of the very few cells of the immune system that are not derived from bone marrow, being of fibroblast origin. Kupffer cells: Specialized macrophages found in the liver where they remove dying or damaged red blood cells and other material from the circulation. They make up a major fraction of the phagocytic cells in the body. T and B Lymphocytes: are often found in close contact with dendritic cells; this is presumably where antigen presentation and T–B cell cooperation take place. Stem cells: The totipotent bone marrow stem cell, giving rise to all the cells found in blood. Blood platelets: although primarily involved in clotting, are able to phagocytose antigen–antibody complexes, and can also secrete some cytokines, such as transforming growth factor β (TGF-β). RBC: Antigen–antibody complexes that have bound complement can become attached to red blood cells via the CR1 receptor which then transport the complexes to the liver for removal by macrophages. This is sometimes referred to as ‘immune adherence’. PMN: Polymorphonuclear leucocyte, the major phagocytic cell of the blood; however, not conventionally considered as part of the MPS. MONO: Monocyte, formed in the bone marrow and travelling via the blood to the tissues, where it matures into a macrophage. Some monocytes patrol the surface of blood vessels, presumably to repair sites of damage or infection. MAC: Macrophage, the resident and long-lived tissue phagocyte. Macrophages may be either free in the tissues, or ‘fixed’ in the walls of blood sinuses, where they monitor the blood for particles, effete red cells, etc. Macrophages in the lung alveoli (alveolar macrophages) are responsible for keeping these vital air sacs free of particles and microbes. Macrophages (and polymorphs) have the valuable ability to recognize not only foreign matter, but also antibody and/or complement bound to it, which greatly enhances phagocytosis. Despite their important role in host defense, the over-activation of macrophages and particularly their ability to produce high levels of reactive oxygen intermediates and the inflammatory cytokine TNF-α, is increasingly recognized as playing an important part in a very wide variety of chronic inflammatory conditions, including such common diseases as rheumatoid arthritis, psoriasis, Alzheimer’s disease and atherosclerosis. Antibody-mediated cellular cytotoxicity (ADCC): Monocytes, macrophages and granulocytes can all kill target cells by a process similar to that of CD8 cytotoxic T cells but it is mediated by an antibody-mediated interaction (ADCC). Sinus: Tortuous channels in liver, spleen, etc. through which blood passes to reach the veins, allowing the lining macrophages to remove damaged or antibody-coated cells and other particles. This process is so effective that a large injection of, for example, carbon particles can be removed from the blood within minutes, leaving the liver and spleen visibly black. Microglia: The phagocytic cells of the brain, implicated in tissue injury leading to Alzheimer’s disease and multiple sclerosis. Unlike other tissue macrophages, microglia may be derived from a special precursor cell that enters the brain before birth and divides within the brain. Lysozyme: An important antibacterial enzyme secreted into the blood by macrophages. Macrophages also produce other ‘innate’ humoral factors such as interferon and many complement components, cytotoxic factors, etc. Giant cell, Epithelioid cell: Macrophage-derived cells typically found at sites of chronic inflammation; by coalescing into a solid mass, or granuloma, they localize and wall off irritant or indigestible materials. However, granulomas also have a major role in disease (e.g. in tuberculosis) by obstructing airways and causing internal bleeding.